Using a walker increases mobility, independence, and strength, so choosing one that is the best for your needs will help achieve your goals. One of the best things you can do is to consult with a physical therapist (PT). A PT will help you select the walker that is right for you and teach you how to use it in a variety of settings. 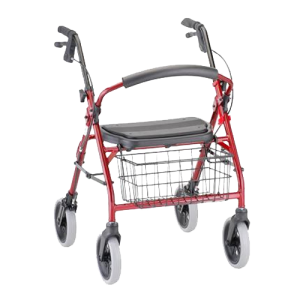 When you’re choosing a walker, it is important to take into account complexity, maneuverability, and size. Standard walkers are the cheapest. They’re sturdy and have no wheels, requiring you to move by lifting your arms. A rolling walker typically has two wheels, which are less stable but easier to move. And a rollator has three or four wheels and typically comes with a seat and basket/bag. Rolling walkers and rollators tend to be around the same price. 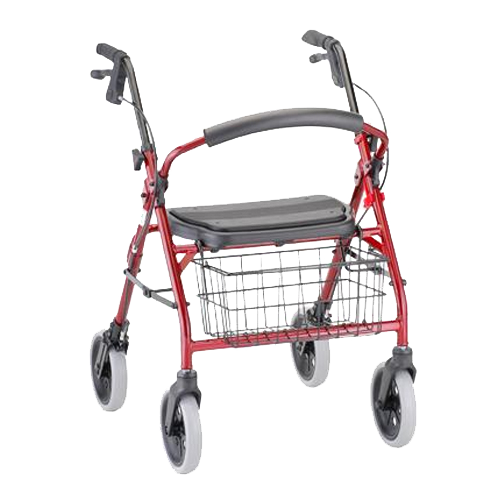 It is important to have a walker that is the right size & height for you and your home. The recommendation is that the handles be adjusted level with your wrist when your arms are hanging at your side. If your walker has a seat, be sure it is adjusted so that you will sit comfortably, and that the walker can bear your weight. With a rollator, it is important your feet are able to sit flat on the ground to avoid rolling away. Check all the doorways in your home to be sure you can access the room with a walker. Fitting through the bathroom door can be a challenging location. Rollators with brakes and seats are easy to maneuver, but they require more strength and presence of mind to operate safely. Standard walkers can be difficult to maneuver, but are more simple and easy to fold. For walkers with wheels, it is important to consider where you will be using walking. Indoor usage will only require small wheels, but if you plan to go outdoors you’ll want tires that are big and soft for traction. Know how to fold the walker for storage or transportation, (some have triggers that may trap your fingers when you’re not prepared). Ensure it is the correct size for your vehicle. They usually come with bags that will fit easily in a vehicle and make them less conspicuous. Many walkers have extra storage, cup holders, and food trays available. If these are important to you, be sure to choose one that allows attachable accessories. Most walkers are available with foam grips for easier use. Shop around to find one that is best for you and in the right price range. Talk with physical therapists and experts who can help you. And if possible, take the walker for a test drive before you purchase.